Some Ministers belonging to the Sri Lanka Freedom Party (SLFP) are planning to team up with the United National Party(UNP) to form the new coalition government, while others are trying to align with the opposition. The two parties are trying to part ways, in the aftermath of the electoral defeat at the local government polls. 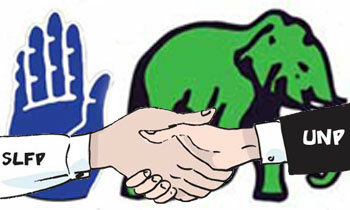 However, some SLFP ministers will throw their weight behind the UNP while the others will sit in the opposition as a separate group. They also have plans to rally behind other political forces in the opposition. Most of these ministers are in Parliament while being rejected by the voters. The UNP won't accept them neither the JO. Sirisena created this mess , now he has no clue. Excuses wont do. Please change the batting line. The opponents know his weak points and can easily get him out. If you do not do so the head selection will get a no one player for outside if your team does not have one. GOOD ..... AND SELECT COMMON PARTY SYMBOL AS " THE DUST BIN"
Rats jumping off sinking ships! Those who are trying to join hands or held the UNP are nothing but traitors who should not be re-elected to parliament. @das criminal who killed 60000 thousand youth in 1989? Litchavie must resign, for a suitable person to take the seat. Anything for power. Poor Mother Lanka. All are corrupt and all know that. The problem is the Leader. Prez cannot tolerate mote than that. Or else the leader should have contested instead of the present Prez. First and Foremost is MR to be sacked from the SLFP ? - This ia an obvious thing to do. Why is SLFP scared to do this ? What happened at Attanagalle and how did Madam C ended up taking a flight out of the country. Dont take any one.all these are theives and disable for any good work,same like sirisena and ranil. MY3 to join UNP. UNP TNA Government. MR, still SLFP, to the leadership of SLPP SLFP and the opposition leader.UNP to reform, the best opportunity ever. Remove RW. Why prolong the end. SLFP. there should be no ministries for MS as otherwise it is useless. To join,is there any slfp any more???. If UNPs are killers then how we assess MR and his notorious SLPP. This is a question to those voted for SLPP who do not want to believe they are corrupt. Everybody is the looser in this election.Nobody has 50% of the votes casted. Everybody has to go for the 50% mark with some good work. Moreover More than 150 LGs hung.Only Minister Rajitha seems to realize this.Others are just talk foolish. Don't forget that the UNP is the only perennial political party in this country led by some of the most illustrious leaders, unlike the SLPP which is composed by a bunch of 'ahindas'. Ranil became PM not by design but implied. He has to gracefully fade away and make way for a 'fire brand' leader who has just about 2 years to turn things around.